COMMENTARY: As the 2019 Legislature kicks off and budgets are issued by Governor Lujan-Grisham and the Legislature, New Mexicans should be worried about the future of their state. The $1.1 billion surplus generated by oil revenues is a one-time surplus. Prices have gone down significantly in the oil patch and the revenue picture is uncertain. Unfortunately, at least if their budget proposals are any indicator, the Legislature and governor seem to think that big new government spending programs can be funded year after year. Lujan-Grisham’s budget clocks in at $7.1 billion. 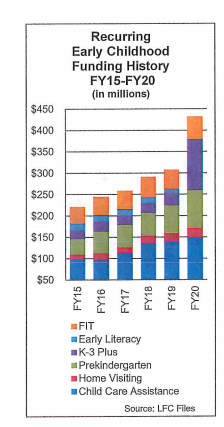 That’s a massive increase of $806 million over Martinez’s last budget and represents a 12.7 percent annual increase. That’s a bigger increase in one year than Martinez had over eight. More than half of the new spending will go to education, with additional funds dedicated to pay hikes for education staff and other government employees alike. All education workers will get at least a 6 percent pay bump. That sounds really great. We all want New Mexico to get out of last place when it comes to education results. But the correlation between education spending (or even teacher pay) and student outcomes is weak. We’ve been down this path before with little to show for it. During the first six years of Bill Richardson’s administration, K-12 spending grew rapidly from $1.88 billion to 2.6 billion, a 38 percent increase. Even fiscal conservative Gary Johnson presided over large increases in K-12 spending. It is hard to say that anything significant improvements in student outcomes came about due to that new spending. In fact, according to the Foundation for Educational Choice’s “Back to the Staffing Surge” report, between 1992 and 2014 New Mexico spent 44 percent more per pupil after adjusting for inflation. While teacher pay did rise 3 percent in real terms of that time period, and their numbers increased as well, the bulk of new hiring was in the area of “non-teaching staff,” which grew by 44 percent, while teacher counts grew by 28 percent. In other words, the bulk of new education spending went to more bureaucracy. And yes, hiring more teachers may shrink class sizes, but it is quality, not quantity, that really drives education outcomes. New Mexico has yet to find a system for finding and retaining the best teachers. A lot of this article is about education because so much of the money to be spent will be on education, but the entire budget process shows a lack of appreciation for the fact that this oil revenue surge is unlikely to continue. New Mexico may now be producing oil in greater amounts than ever before, but the price is around $50 a barrel now, not $75 as it was in October. K-12 is by no means the only area where recurring spending is being planned for one-time revenues. The governor’s plan to expand film subsidies neatly encapsulates the many problems with the budget process we’re seeing in Santa Fe. We know that the state owes $250 million to film companies that have come here in recent years to film but were only able to get $50 million in taxpayer payouts annually. While it may be wise to pay off that debt and cut our losses by winding down the program, the opposite is happening. The governor has proposed eliminating the subsidy cap entirely to make sure that even when New Mexico’s budget is less flush taxpayers will be committed to pouring more money into subsidies. All of this is pointing to higher taxes in the near future. While some on the left tout the significant tax cuts under Richardson and the smaller cuts under Martinez, they fail to remember that local governments have been busy raising taxes. One of the best ways to improve education is to build smaller schools – more effective than smaller classes. And if intelligently located (On collector streets for elementary and mid-schools, NOT on thoroughfares, as nearly all schools in Las Cruces are sited), traffic declines and safety and parent involvement rise dramatically. (Refer among others to “Issues Preventing New School Sites from Achieving Smart Growth Principles”, presented at NM Chapter, American Planning Assn, Oct 9, 2008.) There ain’t no secrets if you’re smart!